I've been working in Camden for nearly a year and a half and in that time my own diet has progressed from meat-eater to vegetarian to vegan. Funnily enough, the food options around me have also progressed alongside my own transition and over the past year and a half I've seen vegan food companies slowly taking over Camden market. Every month on payday I'll discover a new little vegan joint popping up in Camden so there's always something new to try! Camden is one of London's most unique boroughs and is renowned for its historical punk & rock music culture. Compared to some of the more structured, neighbouring areas of London, Camden is a curation of chaos and creativity with wildly vibrant shopfronts, world famous music venues, intricate street art, one-of-a-kind markets and it has this contagious atmosphere unlike anywhere else in London. It's the OG and grittier version of east London's Shoreditch. Don't get me wrong, I do love Shoreditch too, but Camden definitely has more soul. Granted the hoards of tourists that flock there every weekend can be a strain on even the most laid back Londoner's patience but it's an absolute mecca for vegan food! 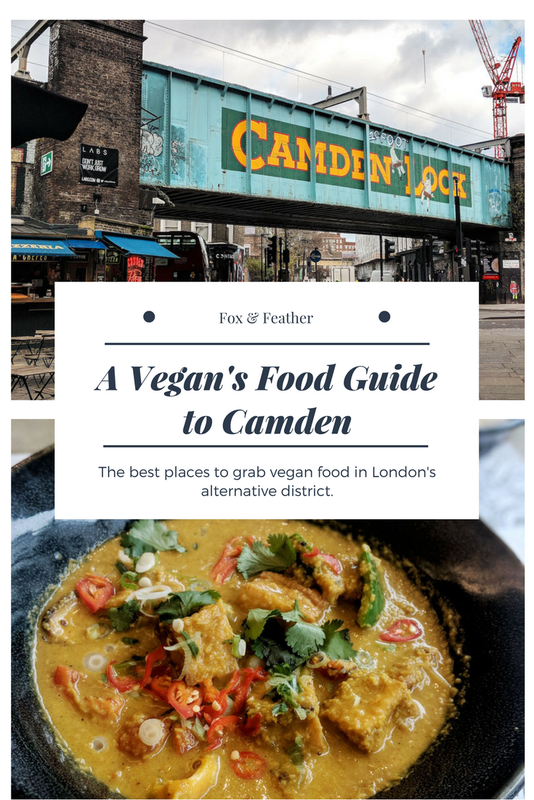 As I'm in Camden at least five days a week nowadays I thought I'd put together "A Vegan's Guide To Camden" for any plant-based pals who may be visiting the area and want the low down on where to eat. Please note: This post will be regularly updated with new Camden vegan finds, so do bookmark this page and check in regularly. I'm planning to add What The Pitta & Purezza once they've opened. As an east London & Essex gal who literally grew up on traditional pie & mash, I knew that was going to be the most difficult thing for me to give up when I decided to switch to a plant-based diet. Little did I know that Young Vegans would soon appear on the London vegan food scene to fill that pie & mash shaped hole in my heart with their entirely vegan pie & mash shop in Camden! Their menu offers their famous 'Seitan & Ale' pie, which is the 'meatiest' cruelty-free pie that you'll ever taste. Also on their menu is their 'All Day Breakfast' pie with a filling of scrambled tofu, caramelised onions, vegan sausage and smoky baked beans, as well as their gluten free 'Curry Pie' with butternut squash, chana chickpeas and lentils in a mild curry sauce and finally, their 'Sweet Potato Pie' with garden peas, tomato and red wine sauce and a chickpea crust - mmm! They also offer up some vegan desserts for those with a sweeter tooth, including their famous peanut butter & chocolate mud pies, which I've been told are heavenly! Fried vegan 'chicken' shop, Temple of Seitan, originated in Hackney back in 2015 but at the end of January 2018 they welcomed a second restaurant after the overwhelming success of their first branch, which is known to frequently have queues leading down the street. Having only been to the Hackney branch once back in the spring of 2017, I was ecstatic to hear that they were planning to open their next restaurant a little closer to home for me in Camden. 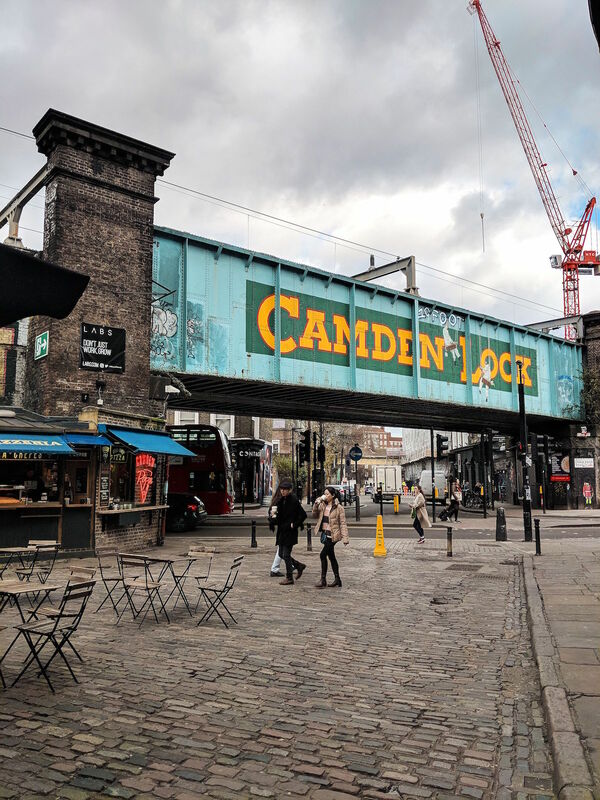 Whilst Temple of Camden isn't really in Camden Town and is a little closer to King's Cross (I suppose it still falls within the borough of Camden), it's a little bit of a walk from the other restaurant and stalls listed in this blog post. However, it's still a pleasant 15 - 20 minute stroll along the canal from Camden Town station, which is a bloomin' lovely walk to take in the warmer months anyway! Temple's menu is very much gluttonous and indulgent, including their famous 'Temple Burger' - a fried seitan, 'bacon' & vegan cheese burger! Their fried 'chicken' dishes are some of the best chicken imitations that I've ever tasted and it's definitely worth the walk out of the way to try them if you're ever in Camden. I strongly recommend their buffalo 'chicken' wings (swipe on the Instagram photo above to view), which are my favourite from what I've tried on the menu so far! HashGreen has a pretty simple premise as they serve up hot & crispy fried potato hash and offer a range of vegan hot toppings including mac 'n' cheese, chilli and more, or you can top them up with as much fresh salad from their buffet! Although they don't really publicly advertise it other than through their social media channels occasionally, they also offer a daily special which changes by the day. One of the Christmas specials in December was their fully loaded vegan Christmas dinner wrap as pictured above and good grief - it was INCREDIBLE! They've also offered 'tofish & chips' and a 'bacon cheeseburger' as part of their daily specials menu in the past, so it's always worth checking in to see what they have on offer that day. Prices are relatively cheap so if you're looking for a bang for your buck (who isn't? ), make sure to stop by HashGreen! 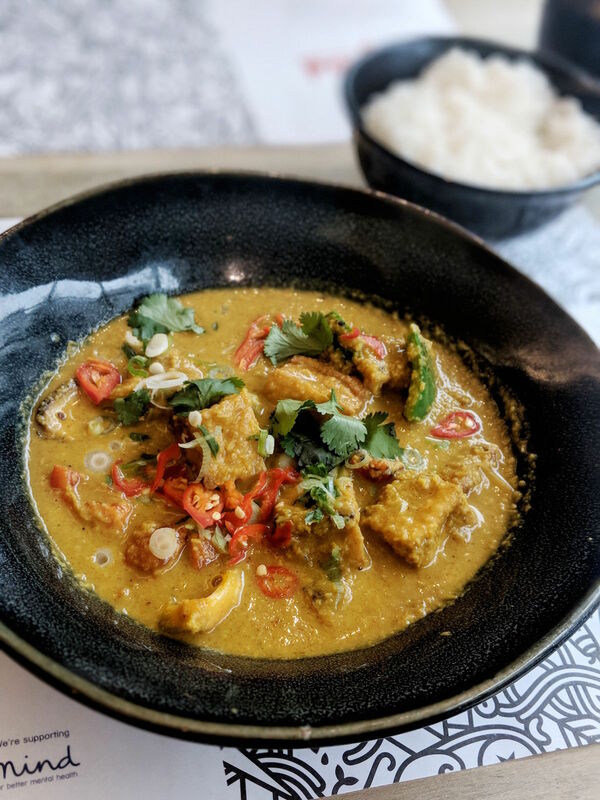 Nestled in Camden's KERB street food market is SpiceBox, an entirely vegan Indian takeaway stall, that serves up tandoori cauliflower, seasonal curries and other tongue-tingling, plant-based delights. Their combo box meal deal including a serving of everything, a naan and a drink is around £10, which does come in a little pricier than a few of the other vegan options around the market but it is bloody delicious! Club Mexicana bring banging vegan burritos and Mexican-inspired street food to Camden's KERB food market located right next to the lock. Despite the intense crowds that the food market attracts, the little neon shack will stick out like a shining vegan beacon in the distance when you finally make it to KERB. Club Mexicana are on a mission to banish the idea that vegan food is all chia seeds, chickpeas and lentils and serve up deliciously, moresome grub that will delight even the most skeptical meat-eater. I've only tasted their BBQ jackfruit burrito served with guacamole, shredded lettuce, pink pickled onions, salted chillies, sour cream, ancho chilli sauce, fresh lime and coriander. However, for fishy fiends they also offer beer-battered tofish tacos served with chimichurri, pink onions, pickled chillies, sour cream and hot sauce. As someone's who has never liked the taste of fish, even as an omnivore, the latter has never appealed to me but I've heard people rave about them all the time! This is one for the burger buffs! Vegan burger bar, aptly named VBurger, is solely dedicated to plant-powered burgers that replace the traditional beef patty with three different cruelty-free concoctions. You can opt for their beetroot & quinoa patty, their feisty falafel & sweet potato smashed patty or their seitan schnitzel for the seitanists amongst us. As well as a range of sides (hello vegan bacon! ), they also offer a chef's special which you have to ask for on the day. When I last visited this cafe it was actually named Campbell's Canal Cafe but a few months ago they went under a rebranding and have renamed themselves as Heaven Canal Cafe. I'm not entirely sure if the cafe is under new management but either way they are still a strictly vegetarian and vegan cafe. As the name suggests, the cafe sits on the canal side and boasts a spectacular view over the water from the High Street. If you don't fancy losing yourself in the maze of the markets, this cafe is an ideal and easy-to-find little stop-off point to refuel. They offer everything from breakfast dishes to evening main courses and even vegan baked goods! The prices can be a little pricey compared to the options above but it's a cafe rather than street food so it's to be expected. As well as their set menu, Heaven Cafe also offer a number of freshly baked vegan treats behind the counter too so it's a great place to for cake, coffee and a catch up! Every veggie and vegan in London is familiar with Mildred's even if they haven't eaten there; it's a name that is echoed again and again within the vegan community because of it's delicious & strictly vegetarian & vegan menu (around 90% vegan too!). It initially opened way back in 1988 when 'vegetarian restaurants were still stuck in a 60s vibe – doling out ‘worthy’ brown food into earthenware pottery placed on pine tables' but Mildred's wanted to take the vegetarian food stereotype and make it something much more exciting with more colourful, international veggie food! After months and months of various people urging me to go, I finally discovered what all the fuss was about and I loved it so much that I went back a week after my first visit! Located just off the the main high street on Jamestown Road, Mildred's is a nice escape from the waves of chaotic tourists that bustle up and down the main street. The menu offers a range of international dishes, including curries, burgers, burritos and more, and changes every few months or so meaning it draws you back to taste new dishes. Hands down, Mildred's offer some of the best and most wholesome vegan food that I've ever eaten - their Sri Lankan sweet potato & green bean curry is to die for - and it's a great place to take any omnivore pals if you're stuck for choice because the food would impress the not-so-vegan amongst us*. *I've tried and tested this as I took my dubious, omnivore mother and she ate entirely vegan and finished every single dish! 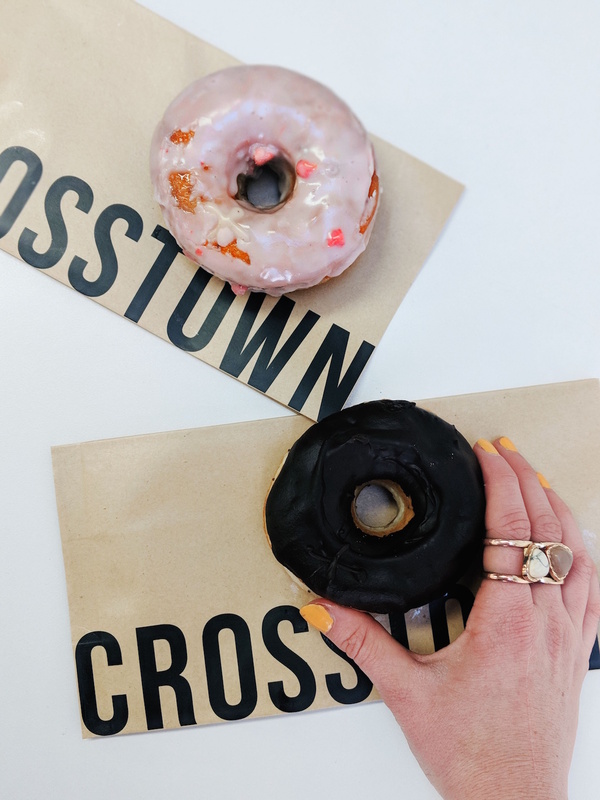 Whilst Crosstown Doughnuts are not strictly vegan, they offer up two vegan options on their menu, including a sweet strawberry & elderflower and an incredibly indulgent chocolate truffle doughnut. It's best to get down there early though as I've found out that the two vegan options tend to sell out pretty quick! 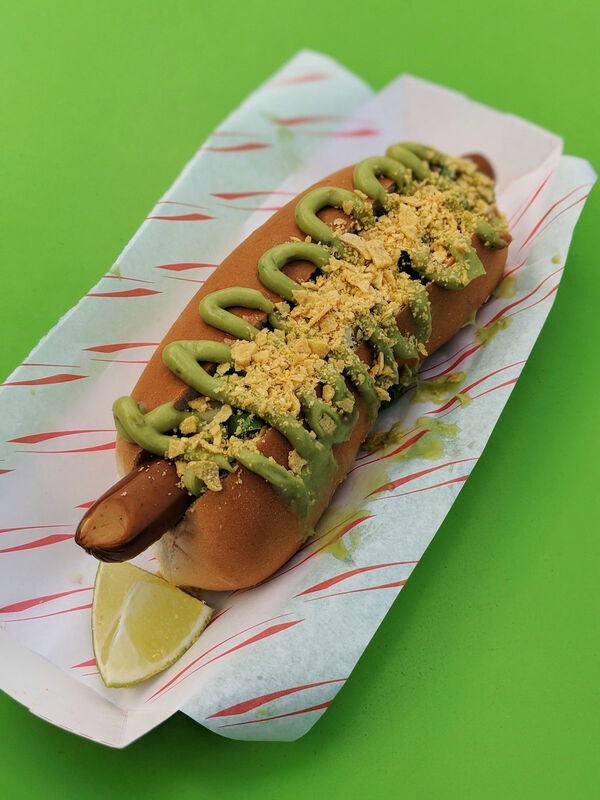 Somedays you just really, really crave a simple hotdog (well, I do at least) and luckily Good Dog have arrived in Camden's Stable to settle those cravings with their 100% vegan hotdogs - that's vegan dogs, vegan buns & vegan toppings! Whilst all the hot dogs are made from the same organic tofu, they offer five different combination toppings including vegan chilli, guacamole & crumbled nachos (pictured above), crushed peanuts & coriander or just a simple tomato ketchup & mustard combination. Each hotdog is £7 and sides, including sweet potato fries, are priced at around £3 per dish. Vegan food in Camden is great! I love Mildred's, and used to love Campbell's Canal Cafe - I haven't been since it changed to Heaven. I'll definitely save this post for when I'm next in Camden, I definitely need to check out that hot dog place! Have you been to Cookies & Scream? They're an amazing bakery in the middle of the market, I love their stuff.